Welcome Molly and Lucy, mini australian shepherds, to our Kansas homestead! 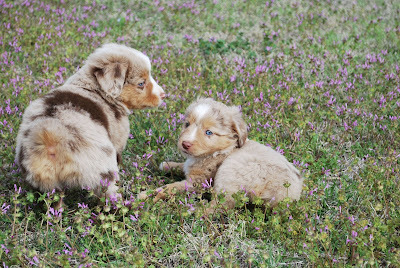 These two are sisters, born March 2nd, and are red merles. Molly is the bigger of the two, and I've already nicknamed her Molly the Monster, because she definitely has the upper hand over her sister, Lucy! 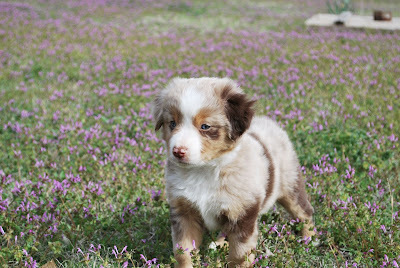 Being that they are mini aussies, they will only weigh in the 20 to 30 lb range. 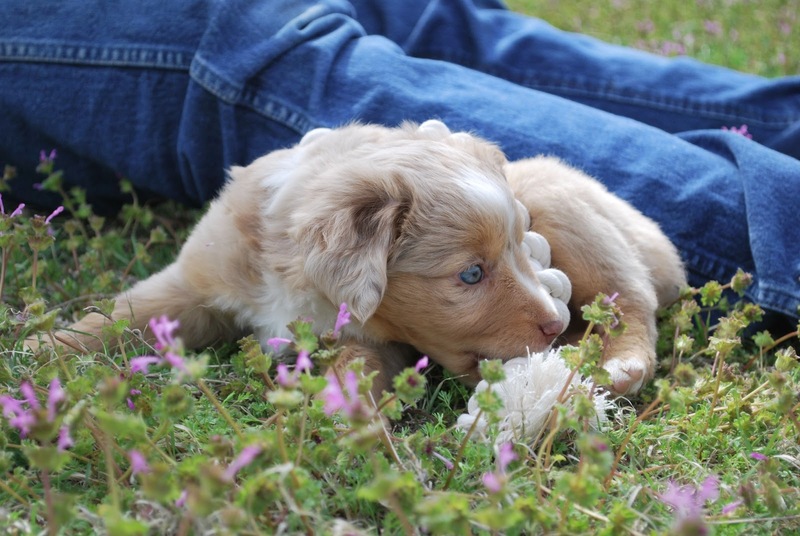 For now, basic puppy training will get them headed in the right direction. We have fresh, new blank palettes to work with, and we want these girls to be polite and well-mannered from the get-go. There's a whole photo album posted on Facebook, so friend me if you want more puppy love. I'll try to be a better blogger and post frequent updates here for everyone. The next few months will be lots and lots of fun with these two very smart and intelligent girls! A week ago Sunday, this is what we found in Sally's nesting box... two baby chicks! Sally had been sitting on a clutch of eggs since late February. Needless to say, by the time April 7th rolled around, we were ready to get rid of her eggs. 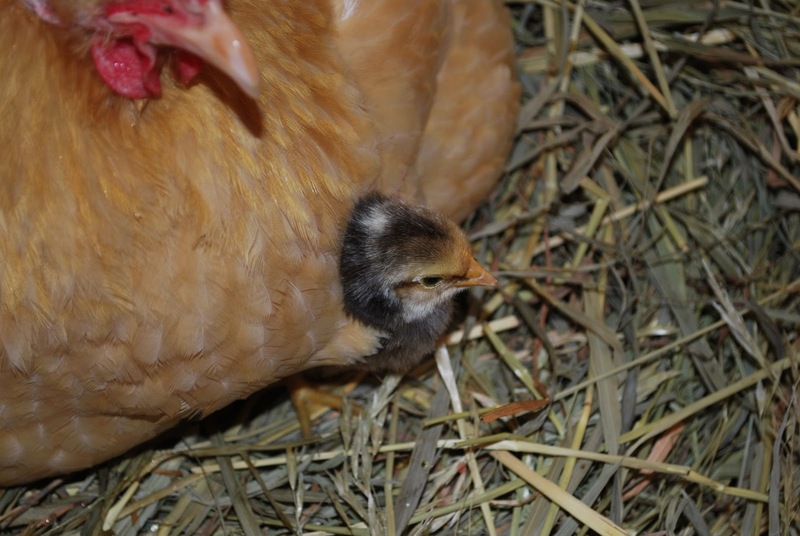 Chicks only take 21 days to hatch. And then, amazingly, two eggs hatched out these little barred rock chicks! Looking back, I think what happened was this.... several times, when Sally hopped out of her box to get a bite to eat and a quick drink, one of the barred rock hens would get into her box. So Sally would just hop into a different box and sit. Hours later I would find her in the wrong box, with the clutch of eggs cold. So even though many of the eggs didn't hatch, I believe our barred rock girls laid a few late eggs that finally got a consistent "sit" from Sally and hatched out these little sweeties! Now only time will tell if we have hens, or roosters!! Hopefully, these two little cutie pies are hens. 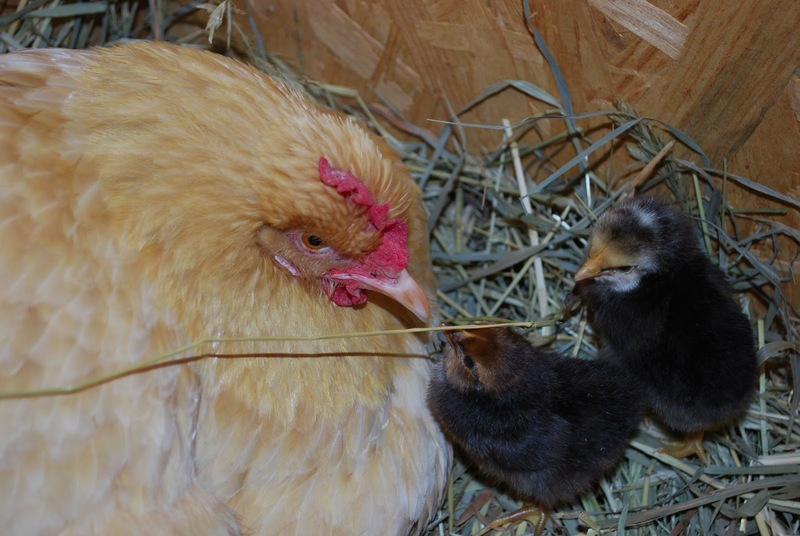 Don't you just love it when little chickies poke their heads out from mom's feathers? !